I said then that this series was part of the run-up to my pickling workshop. 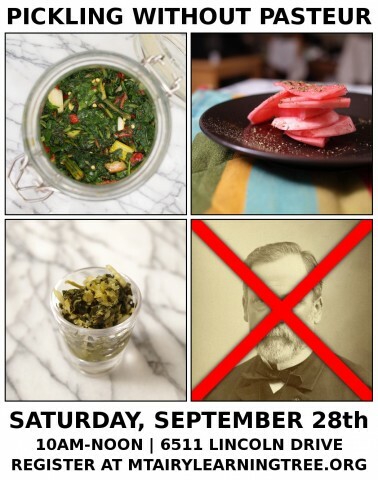 And my pickling workshop, dear readers, is this Saturday, September 28. So — here is my ulterior motive: if you’re going to be in Philadelphia on Saturday, and if you love pickles, and if you want to learn how to make them, and if you like the idea of getting to take a couple of jars home with you at the end — come down to the Unitarian Society of Germantown (6511 Lincoln Drive, Philadelphia, etc.) from ten ’til noon and get your hands into the brine. There will be massive Korean radishes for kkakdugi kimchi. There will be heads of cabbage for kraut. There’ll be some sort of short presentation about our microbial friends, and why we should embrace them. And there may, conceivably, just possibly be some red peppers in there, too. You can register here, through the Mount Airy Learning Tree’s website. It costs $29.00 to join. But if you use the coupon code NEW13F, you get a ten percent discount because mine is a new course. Click now. You know you want to. 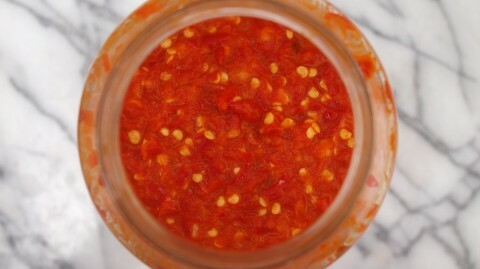 This week’s experiment, like I said somewhere amidst my hard-sell pitch, is fermented red hot pepper sauce. Like this green hot sauce from a post way, way back in the wild-west days of the blog, it owes a great deal to that second most famous of all Vietnamese spicy condiments: túóng ót toi. Similar its celebrity cousin Sriracha , we primarily know túóng ót toi in the United States through the mad genius and gentle good graces of Huy Fong Foods of Rosemead, CA. They began making the stuff some time in the early 1980s for distribution to Asian restaurants in the greater Los Angeles area. And — well — it kind of took off from there. Today, their túóng ót toi is national. Nay, international. I like a big spoonful of the stuff on my broken rice, next to my thin-cut pork chop at Philadelphia’s Vietnam House restaurant. You can get it shipped to you in Wyoming, or Florida, or Newfoundland through Amazon.com (achem — click!). Though I have to admit, my favorite distributor of túóng ót toi is a little website called houseofchilli.com, which offers free delivery on orders over £30 to any address on … the Isle of Wight! 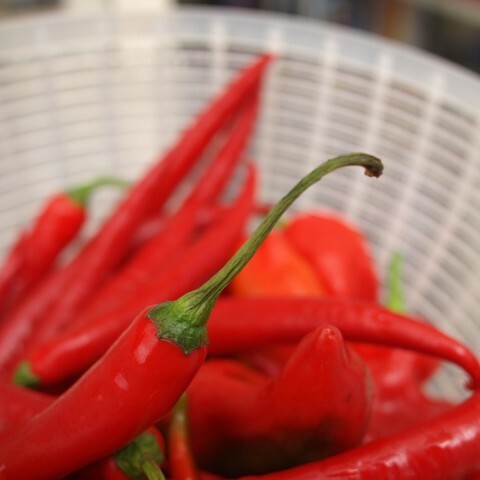 The House of Chilli, according to their own publicity, is a hothouse of chilli inspired creativity parked on that holiday hotspot just off Albion’s southerly coast. And for being the greatest, unlikeliest hot-sauce outlet I could suss out on the Internet, I feel that I owe them a particularly enthusiastic salute. At any rate, the thing with túóng ót toi, at least according to all the recipes that I could find, is that it’s usually a vinegar-based quick pickle. It’s a sweet-and-sour deal, where the sweetness of the red peppers is enhanced by a little bit of sugar, and then balanced out by a couple of spoons full of white vinegar. But not so with my red hot pepper sauce. Here, I’ve jettisoned the vinegar entirely in favor of a fermentation-based sour. I’ve retained the sugar. But instead of simply sweetening the concoction, it offers a nice house-warming gift of nutrition to all those yeasts and bacteria that make this recipe distinct. 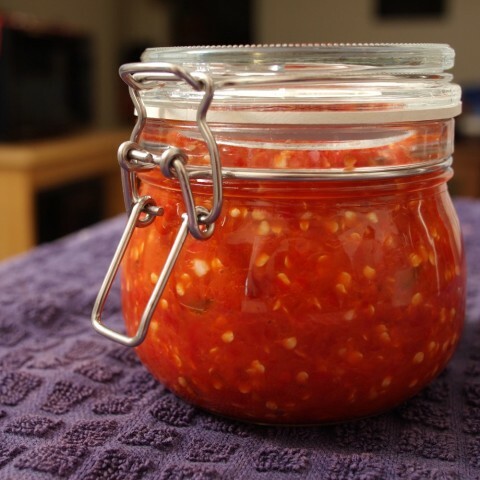 The thing with a lacto hot sauce is that it takes a considerable long time to get its sour on, and it may be kind of sluggish to start fermenting at all. Which is why I would recommend adding a bioactive starter to get it going. A couple of tablespoons of the liquid that concentrates at the top of a tub of yogurt should do the trick. Or, if you’re like me and have lots of other pickles floating around at home, a tablespoon of brine or sauerkraut juice really gets those red peppers moving. Intrepid fermenteers: this recipe should be a walk in the park for all of you. Pickling apprentices: give it a try. 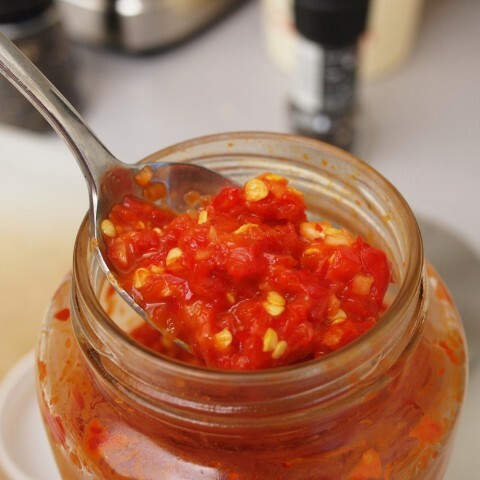 Fermented red hot pepper sauce makes a delicious addition to all kinds of foods — not just Vietnamese. And come winter, when there are no more fresh hot peppers to be found, you’ll be glad you have it around. To the workbowl of a food processor, add the peppers and garlic, and chop until the mixture is chunky but well integrated (10-15 seconds). Add the fish sauce, sugar, starter liquid, and just a small drizzle of olive oil. Mix with a spatula, and scrape down the sides. Then whiz the food processor until the whole thing is puréed. Pack the mixture tightly into a clean quart-sized jar, cover loosely with a plastic lid, and store in a dark place at room temperature for one to two weeks, or until it has soured to taste. Once you judge it done, move your hot sauce to the refrigerator. This ferment has a tendency to separate (liquid on the bottom, solids on top). So while it’s at room temperature, I would recommend checking on it every two days or so, giving it a thorough stir, and pushing it back down with the back of a spoon. Unless you like burning hands (the pain, not the eminently useful D&D spell), I would also recommend wearing gloves when you make this. 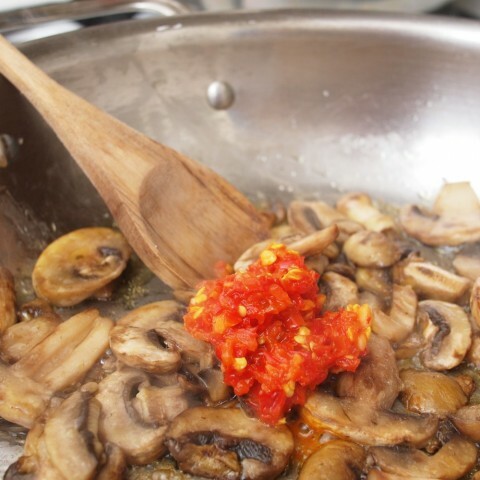 To use, add a tablespoon or so of your hot sauce to pasta sauce, or roasted vegetables, or pretty much anything else that you’re cooking tonight. 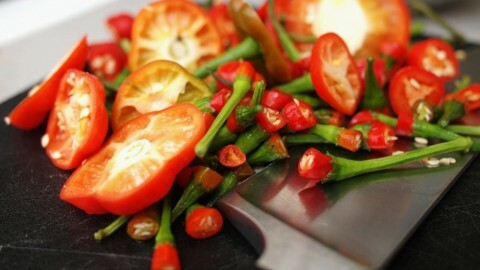 It will add a complex spicy flavor that will be sure to impress all but the most ardent capsicumophobes in your life. Awesome recipe and detailed content – thanks for posting. My family owns a hot sauce and fiery foods retail store and yet I find myself more intrigued to make my own sauces. Granted I can quite make one as good as some of my favorites – I’m always looking for that 1 recipe. Chili garlic sauce is my absolute favorite. We’re looking to start a recipe page on our site so this may be a great inspiration.